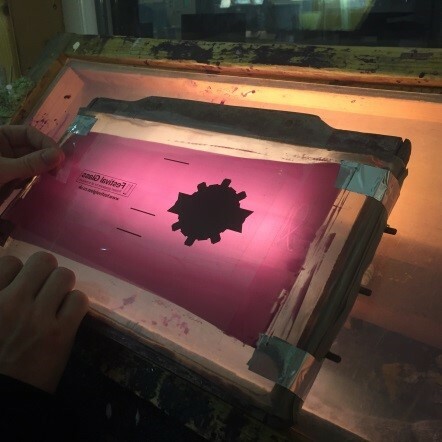 The direct screen printing process is a very traditional way of printing. At Festival Glass we have our own in house screen department which ensures that we have total control over the production process. Each colour that is applied to the glass will have its own screen. To decorate 5 colours onto the glass, it would need 5 screens making to apply the logo. 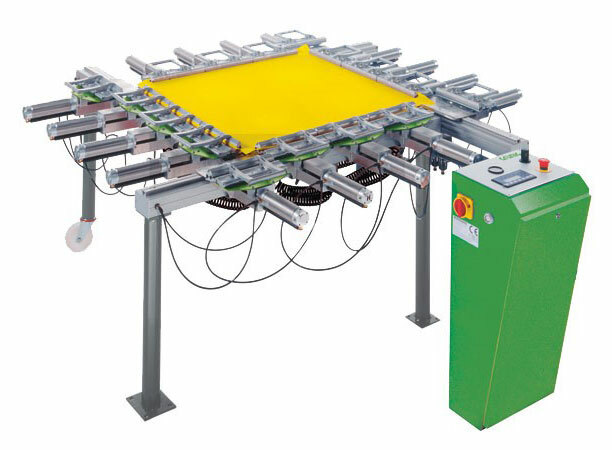 Each screen can take up to a maximum of 2 hours from start to finish. The actual screens are either wooden or an aluminium frame with stainless steel or polyester mesh stretched over the screen and either glued or stapled to secure the mesh, the mesh that we use varies subject to what decoration is required. The finer the detail the higher the mesh count. 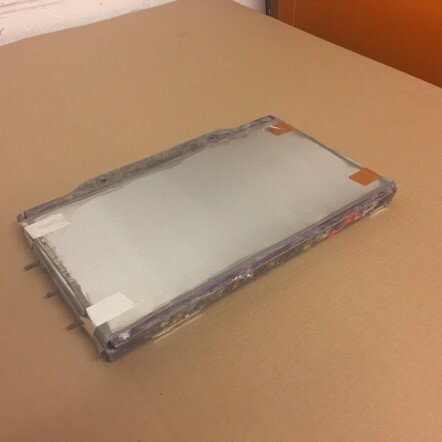 We use stainless steel for all thermoplastic colours so we are able to heat the screen to melt the paint. This type of paint ensures a density to the actual final decoration. We use polyester mesh for organic colours (paints used for printing plastic and toughened glass) where we have no need to heat the screen. 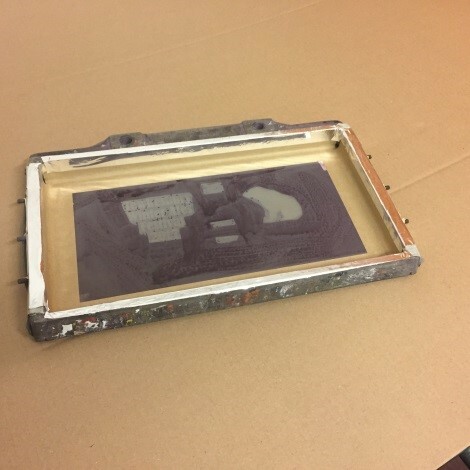 The whole process starts by stretching the material over the screen and securing with either staples for wooden frames or very strong glue for the steel and trimming any excess material away. 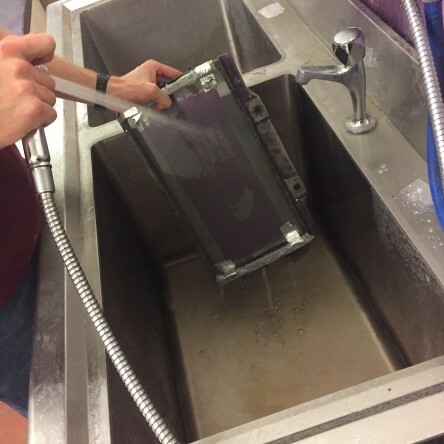 Next we will prepare for coating each screen with a light sensitive emulsion by degreasing the mesh clean and dry. 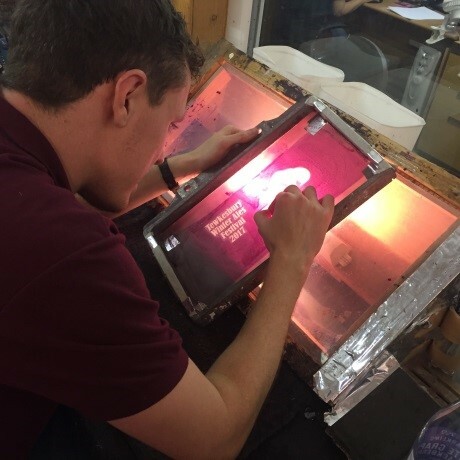 Then we are able to apply the light sensitive emulsion evenly over the screen. 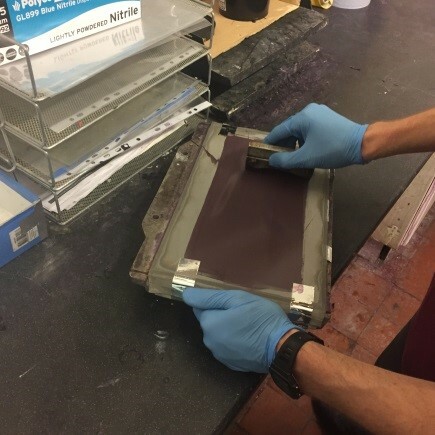 Once complete it is then to be dried in a temperature controlled dyer, once dried we will take the film positive and tape it to the back of the screen. 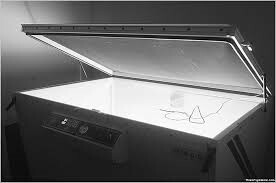 We then place the screen on to a device called an exposure unit and expose the screen with light for a limited time. The dark areas (the image) on the film positive will prevent light from passing through and exposing the screen. The light passes through clear areas of the film positive (where there is no design) and hardens the emulsion. 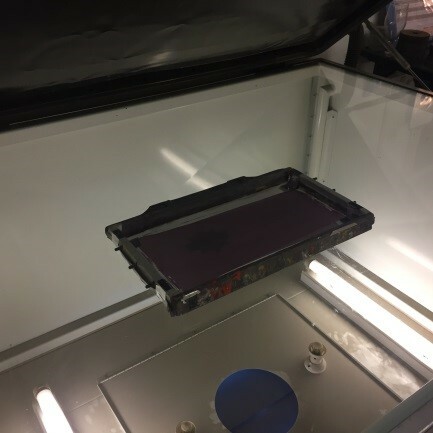 Next, we take the screen off the exposure unit and wash it with water. The water will not wash out the hardened emulsion. The water will wash out the soft areas that the light was not exposed to. The screen will then be dried again in the drying unit. Once dry we will paint out with light sensitive emulsion any areas that need attention to prevent any paint passing through the screen where it shouldn’t. The screen is then dried again for the last time. We are then left with a screen that has an image on it. The ink will pass through the open areas of the mesh generating the design on to the glass.